My friend and fellow grandma blogger Connie recently started a linky called Say It Saturday on her Family Home and Life blog. For those who don't know what a linky is, it's a feature that invites other bloggers to add blog post links related to a particular topic, and Connie's chosen topic is anything related to grandparenting. Connie's hope with the SIS feature is to help create a network for fellow grandparent bloggers. Right away Connie had several grandma bloggers posting their links, myself included. Funny thing is, although I've been a grandma blogger for nearly three years and pretty sure I'd run across most other grandma bloggers, Connie's linky revealed a few I had never even heard of. I was delighted to click on their links, visit their blogs, and make new friends. As the grandparent-only linky was clearly a great way to meet other grandma bloggers and drive traffic to one's blog, Connie emailed me the other day to ask why I don't do a linky on my blog. I didn't have a good answer. Her question got me thinking, though...and researching. Ultimately, it inspired me to try it out. 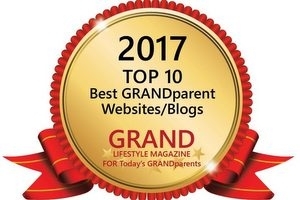 My intention with featuring a weekly linky on Grandma's Briefs is, like Connie, to help develop and encourage a network of grandparents online, a grandparent network of both bloggers and non-bloggers. As we all know, there is a strong grandparent presence online, we've just not yet found a way to network with one another the way many other bloggers have (think mommy bloggers and food bloggers). I hope to join Connie in encouraging such networking, connecting. 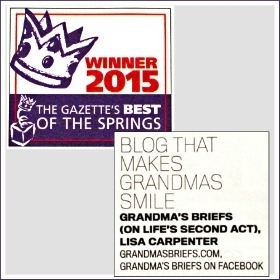 Let me assure you that having a linky for grandparent bloggers as a regular feature on Grandma's Briefs doesn't leaving out the non-blogging visitors; in fact, the linky will give Grandma's Briefs readers many more (I hope) grandparent blogs to peruse. I'm sure non-bloggers will get as much from this new feature as do the participating bloggers. So here it is, the debut of GRAND Social, a linky just for grandparent bloggers, to be featured Mondays here on Grandma's Briefs. I'm delighted to have you join me in the venture. 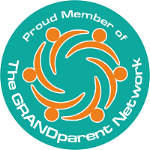 All grandparent bloggers are invited to add a link. You don't have to blog specifically about grandparenting, you just must be a grandparent who blogs. From your blog, copy the direct link to a specific post you want to share, not the link to your blog's home page. The post you share can be new, it can be old, it can be one you feel should have gotten better exposure, it can be one that got more comments than usual and you want to promote it even more. Your choice, so have fun with it. All content must be safe for work and family friendly; I reserve the right to remove links I deem otherwise. Adding a mention at the bottom of your linked posts, such as This post has been linked to the GRAND Social blogging event, is appreciated but not required. I encourage all readers and participating bloggers to visit the posts others have linked to by clicking on the thumbnail photos. Please comment on those you visit, as that's how we get to know one another, support one another. Feel free to mention you visited directly from their link on GRAND Social. Thank you for participating in the inaugural GRAND Social—as a blogger, a reader, or both. And thank you to Connie for encouraging me to give it a shot. Please leave a comment to let me know what you think of GRAND Social, as a reader and as a blogger. Thank you.